Aerate and top dress your lawn. Use an aerator that cuts and removes a plug of soil, which it places on the soil surface. The machines can be rented or the service purchased. Apply ½ inch of compost after the aeration. The compost penetrates the aeration holes to bring organic material into the root zone. It is too early to fertilize. Wait until real grass has been mowed twice. Mow as needed to keep the lawn weeds in check. Apply a pre-emergent herbicide to prevent summer weeds from germinating. This is especially important if you were bothered by sandburs and/or crabgrass. Scotts Halts (Amazon & Lowes)and Green Light Amaze (Amazon & Lowes) are good herbicides for the job. I have also found corn gluten meal (Amazon & Lowes) to be a good natural product for the job. To be ready for the hot weather when it arrives, call in your irrigation contractor to check out and repair your system. Make sure the rain sensor is working and all leaks are repaired. Have them instruct you how to change the watering amounts if necessary. Have your mower sharpened and the engine tuned up. Mow in March to keep the lawn weeds in check. Mowing starts in earnest this month. Mow St. Augustine and Bermuda to 3 inches tall, zoysia to 2 inches tall and buffalo grass to 5 inches. Mow frequently enough that only one-third of the grass blade is removed at every mowing. Once per week is usually sufficient. After you have mowed the lawn two times, it is time to fertilize the lawn. I like Scott’s Green Max Lawn Food for this application. 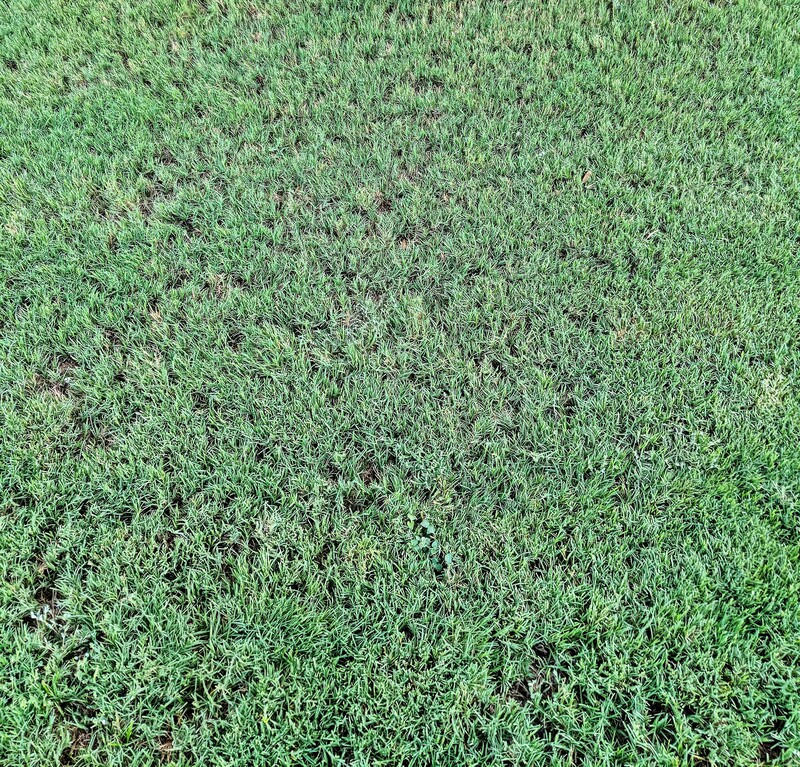 Chlorotic (yellow) grass is a common symptom of St. Augustine grass. It appears in spring when the soil is too cool for the roots to pick up iron. Chlorosis will address itself with time and a change in weather or you can apply an iron chelate product by hose-end sprayer. Rely on the weekly watering recommendation provided by SAWS and posted weekly by email to determine how much water to apply each week. Sign up on their website, saws.org, even if you are not a SAWS customer. The recommendation is based on San Antonio’s actual weather conditions and proven by more 15 years of use. The winter weeds are trying to go to seed before the heat kills them. Keep the lawn mowed every week to reduce production of the weed seeds for next winter. Make your second application of pre-emergent herbicide to prevent sandburs. It is time to apply a soil insecticide if your lawn was attacked by grubs last year. The same insecticide will also control chinch bugs. Watering is the key. Let SAWS’ recommendations be your guide. For especially hot areas such as along the sidewalk that seem to dry out, give them a little extra water by handheld hose. Chinch bugs will make your lawn look moth eaten. The damage usually appears on the hottest part of the lawn. 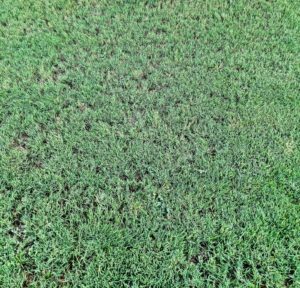 The lawn drying out will cause a similar symptom. Handwater the spots every day for two or three days. If the area does not green up, it is probably caused by chinch bugs. Apply a soil insecticide. Apply a pre-emergent herbicide to prevent winter weeds. Check the label to make sure the weeds you had last year in your yard are on the label. Rescue grass, bedstraw, dandelions, thistle, henbit and annual bluegrass are common. Discontinue watering in the evening and let the lawn go a little dry in order to prevent brown patch fungus. If it appears anyway, apply a treatment of a labeled soil fungicide. The lawn has switched to its autumn growth mode, so it is time to apply a winterizer fertilizer, which will be utilized by the lawn for winter hardiness and a fast green-up in the spring. Switch to a winter irrigation regime. Water every three weeks if it does not rain from now until May. You should only have to mow every few weeks to control winter weeds.